White jug of earthenware, of curvilinear shape with a black stripe around rim and base, and printed on one side with a design of garden implements and plants with a barrel in black and yellow, and on the other side with nine circular images of garden objects, including a sunflower, wheelbarrow, and cat, in black and yellow. Ravilious was well-known as a wood-engraver, illustrator in the manner of Paul Nash and Bawden, as well as designer for furniture and ceramics. 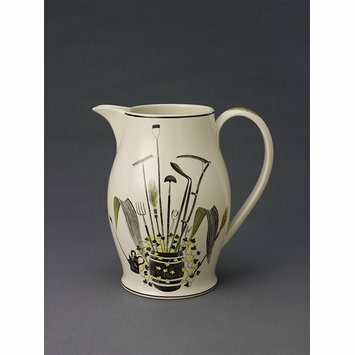 He formed one of a group of designers employed by Wedgwood during the 1930s and 1940s to 'modernise' their image. While acting as Official War Artist in World War II his plane went missing over Iceland. Ravilious was commissioned to produce a range of designs for transfer-printing onto ceramics. The Garden Implements design for a lemonade jug and beakers is particularly interesting for its deliberate and careful historicist reconstruction which nevertheless still asserts a modern effect. The body of the jug is a pure reaction of 18th century creamware in both shape and colour. Transfer printing is a traditional technique and the decoration bears similarities to mottos and imagery which decorated similar wares from the 1770s and 1780s. The iconography of Garden Implements design, with anecdotal garden vignettes on the reverse, pull this jug into the modern world however, evoking homely recreation in a middle class English garden. 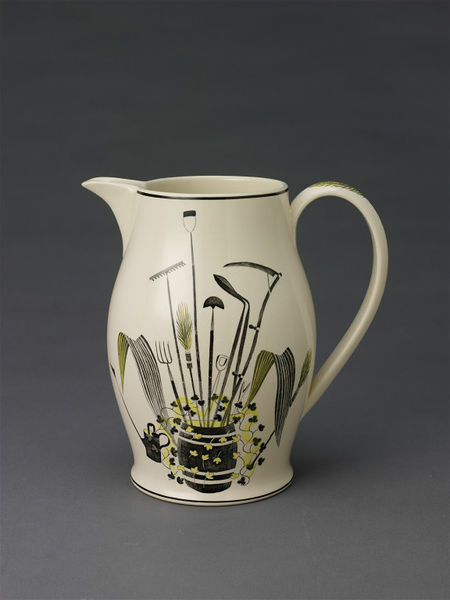 Lemonade jug of earthenware, of curvilinear shape with a black stripe around rim and base, and printed on each side with garden designs, 'Garden Implements', designed by Eric Ravilious, made by Josiah Wedgwood and Sons Ltd., ca. 1939.